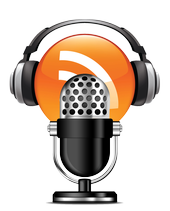 What's Going On In Our Gardening Community? 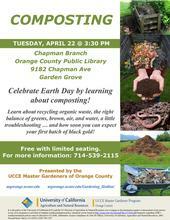 Celebrate Earth Day by learning about composting! 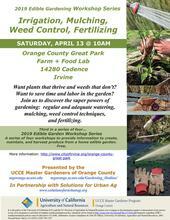 Learn about recycling organic waste, the right balance of greens, brown, air, and water, a little troubleshooting. Selecting the right native plants will not only help you use less water, they will provide sustenance for native insects, and as a results, food for native birds. 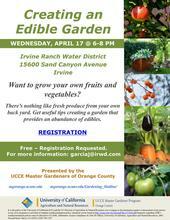 Want to grow your own fruits and vegetables? There's nothing like fresh produce from your own back yard. 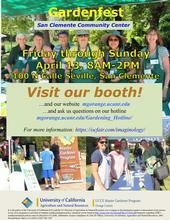 A four-day garden event, featuring 50 unique plant and garden vendors, including 10 inspiring display gardens and a 25-foot floral centerpiece. Would you like to enjoy the beauty of butterflies in your garden? 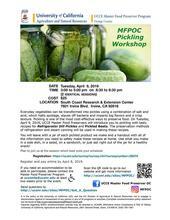 Everyday vegetables can be transformed into pickles using a combination of salt and acid, which halts spoilage, staves off bacteria and imparts big flavors and a crisp texture. Make this your year to grow vegetables! If you're thinking of growing tomatoes this year, or if you want to try your hand at vegetable gardening, we have classes for you. HLB, citrus greening disease, is now present in Orange County. The still incurable disease is spread by the tiny insect, the Asian citrus psyllid. Edibles or ornamentals, irrigation or insects, we're here to help! 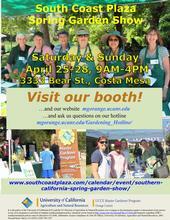 Interested in learning about Backyard Beekeeping in Orange County? 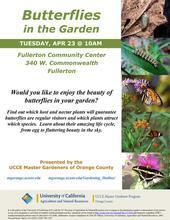 The UCCE Master Gardeners of Orange County are presenting a class with an introduction and overview on beekeeping. The class will be presented on 2 different dates. Get More Information And Register Today. Check out what Master Gardeners are doing in our community. Our volunteers are can been at many venues and events throughout Orange County, California. Check them out. Come visit us at one of the public venues? Are you seeking solutions to conserving water in your landscape? Introducing Saturdays@SouthCoastREC, a new family-friendly adventure series for those interested in learning about gardening and food preservation. Mark your calendars now! Our final event for 2016 will occur on November 5, 2016 from 9:00 AM - 11:00 AM at South Coast Research and Extension Center, 7601 Irvine Blvd, Irvine. We will highlight Gifts from the Garden and the Kitchen. Did you know that along with bees -- butterflies, moths, beetles, birds, bats and even flies -- are pollinators. Syrphid flies, also known as flower flies or hover flies, also eat aphids! Read more about these syrphid flies, including photos of the larvae and adults. There is a new threat to our coast live oak trees. A fungus associated with western oak bark beetle is causing the decline by spreading what is known as “foamy bark canker disease”. 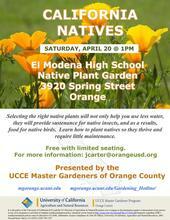 This has been found in urban landscapes in Los Angeles, Orange, Riverside, Santa Barbara, Ventura and Monterey counties. Find more information, including photos of trees with symptoms of the disease, at the Pests in the Urban Landscape blog and the Eskalen Lab website. 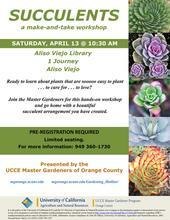 Save the Date for the annual UC ANR Urban Landscape and Garden Education Expo. University of California Division of Agriculture & Natural Resources and Irvine Ranch Water District welcome you to the 6th annual Urban Landscape and Garden Education Expo. The event will be held Saturday, September 27, 2014 from 9:00 am to 2:00 pm. Includes activities for the whole family. The March 2014 issue of UC ANR IPM News is now available. This newsletter contains articles of interest to gardeners and up-to-date information on pest control. Exotic fruit flies such as Mediterranean fruit fly and oriental fruit fly are among the most serious threats to California’s $43 billion agricultural industry and to the home gardener as well. It's time to plan for the fall garden - tasty greens, healthy broccoli and cabbage, peas, beets, carrots, onions, asparagus, and more. The Spotted Wing Drosophila attacks ripening fruit in many California counties. It infests raspberry, blackberry, blueberry, and strawberry crops, especially in coastal areas. It occasionally attacks other types of fruit with soft flesh, such as plums, plumcots, nectarines, and fig. The Polyphagous Shot Hole Borer, a tiny beetle that drills into trees, has been found in Los Angeles and Orange Counties. It brings with it a fungus (Fusarium sp.) that infects the trees. It attacks a wide range of trees, including Avocado, California Live Oak, California Sycamore, Liquidambar, and others. What vegetables to plant now. Tips for growing, harvesting vegetables and controlling pests. April gardening tips from Yvonne Savio on veggies and edible flowers. New information about boxwood blight. Downy mildew on impatiens can cause defoliation! Avocados, citrus, soil and more..
Having trouble with caterpillars in your garden? Are you seeing brown rot at the bottom of your tomatoes? Are you having trouble with tomatoes this year? My plants are growing well but the new growth has aphids. What’s the best way to get rid of them? I need help in starting to grow blueberries. Do palo verde trees need fertilizer? Last year, I had an ant problem. What can I do to avoid the problem this year? There are weeds sprouting in my lawn, and I’d like to identify them so I can use the right control methods to get rid of them. Can you help? I have a few fruit trees in my yard, apples, peaches, oranges, and really need some advice on how to prune them. Can you help? I planted a bamboo hedge in my yard, and it’s really pretty, and I love it. But now there are runners coming up in places where they shouldn’t. Is there any way to control this better – I don’t want to remove my beautiful bamboo. How do I get a school garden at the school my child attends? I just planted a blueberry bush which looks like it will be loaded with blueberries. How do I keep birds and other fauna such as squirrels and opossums from eating the blueberries before I can get to them? 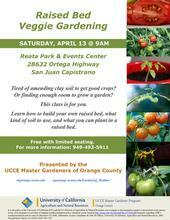 Did you know the the Orange County Master Gardeners are active in the local community?